A new collection of repentance and God's mercy by the 2018 Pastoral Musician of the Year. 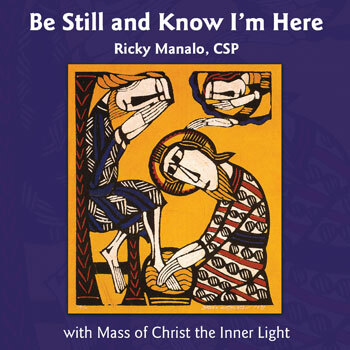 Father Ricky Manalo, the National Association of Pastoral Musicians' 2018 Pastoral Musician of the Year, releases his newest collection, Be Still and Know I'm Here. Focusing on God's love and mercy, this compilation of hymns and songs captures Ricky's well-known blend of traditional sound with the contemporary accompaniment of flute, piano and guitar. Ricky utilizes a diversity of modes to convey wonder and awe, as well as prayer for forgiveness. Within the title track, the flute carries the melody, leading the vocalist from the very beginning of the song. As a composer, he shows his versatility through a variety of instruments, moods and musical styles. Each song encourages meditation, examining moments of darkness, soon graced by God's light. And throughout the collection, there is a beautiful element of hope. Every step of the way, our seemingly solitary journey is actually accompanied by God. His forgiveness and guidance provide us with the light we need to continue on the road to salvation. To complement the more contemplative moments provided by the first five songs, Ricky has composed a Mass setting with gently uplifting movements for choir, assembly and ensemble. The melody follows the pentatonic scale popularly utilized in Asian composition. Mass of Christ the Inner Light is the perfect blend of Western and Eastern musical styles, allowing for an expression of intercultural unity. *Product 30140466 contains only choral compositions for the Mass of Christ the Inner Light portion.